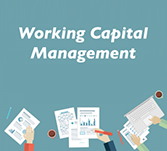 What is Working capital management tutorial? Working capital management tutorial deals with receiving and paying out cash. This tutorial provides approach on different types of methods to optimize the benefits of working capital management along with the practical examples to understand the concepts. This tutorial is targeted for management students and finance professionals. The main target of this tutorial is to provide the readers with an understanding of the working capital management and its importance. One should have basic knowledge of business and macroeconomics. Having knowledge of working capital management concepts will be an added advantage.